Two employees need access to services provided by the server. PC1 only needs FTP access while PC2 only needs web access. Both computers are able to ping the server, but not each other. Step 1: Configure an ACL to permit FTP and ICMP. a. From global configuration mode on R1, enter the following command to determine the first valid number for an extended access list. b. Add 100 to the command, followed by a question mark. c. To permit FTP traffic, enter permit, followed by a question mark. R1(config)# access-list 100 permit ? d. This ACL permits FTP and ICMP. ICMP is listed above, but FTP is not, because FTP uses TCP. So you enter TCP. Enter tcp to further refine the ACL help. R1(config)# access-list 100 permit tcp ? e. Notice that we could filter just for PC1 by using the host keyword or we could allow any host. In this case, any device is allowed that has an address belonging to the 172.22.34.64/27 network. Enter the network address, followed by a question mark. R1(config)# access-list 100 permit tcp 172.22.34.64 ? f. Calculate the wildcard mask determining the binary opposite of a subnet mask. g. Enter the wildcard mask, followed by a question mark. R1(config)# access-list 100 permit tcp 172.22.34.64 0.0.0.31 ? h. Configure the destination address. In this scenario, we are filtering traffic for a single destination, the server. Enter the host keyword followed by the server’s IP address. R1(config)# access-list 100 permit tcp 172.22.34.64 0.0.0.31 host 172.22.34.62 ? i. Notice that one of the options is <cr> (carriage return). In other words, you can press Enter and the statement would permit all TCP traffic. However, we are only permitting FTP traffic; therefore, enter the eq keyword, followed by a question mark to display the available options. Then, enter ftp and press Enter. R1(config)# access-list 100 permit tcp 172.22.34.64 0.0.0.31 host 172.22.34.62 eq ? j. Create a second access list statement to permit ICMP (ping, etc.) traffic from PC1 to Server. Note that the access list number remains the same and a specific type of ICMP traffic does not need to be specified. k. All other traffic is denied, by default. Step 2: Apply the ACL on the correct interface to filter traffic. From R1’s perspective, the traffic that ACL 100 applies to is inbound from the network connected to Gigabit Ethernet 0/0 interface. Enter interface configuration mode and apply the ACL. a. Ping from PC1 to Server. If the pings are unsuccessful, verify the IP addresses before continuing. b. FTP from PC1 to Server. The username and password are both cisco. c. Exit the FTP service of the Server. d. Ping from PC1 to PC2. The destination host should be unreachable, because the traffic was not explicitly permitted. Step 1: Configure an ACL to permit HTTP access and ICMP. a. Named ACLs start with the ip keyword. From global configuration mode of R1, enter the following command, followed by a question mark. c. The prompt changes. You are now in extended named ACL configuration mode. 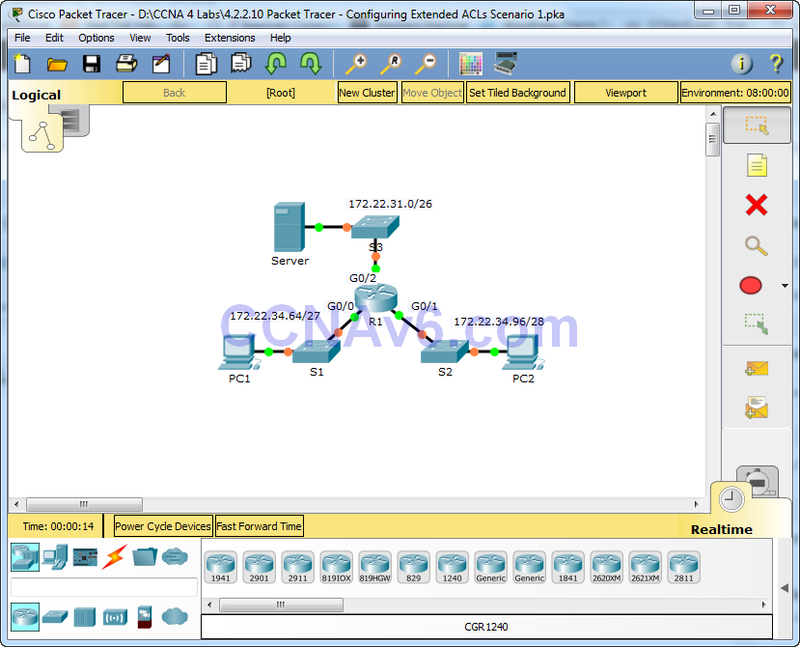 All devices on the PC2 LAN need TCP access. Enter the network address, followed by a question mark. R1(config-ext-nacl)# permit tcp 172.22.34.96 ? d. An alternative way to calculate a wildcard is to subtract the subnet mask from 255.255.255.255. R1(config-ext-nacl)# permit tcp 172.22.34.96 0.0.0.15 ? e. Finish the statement by specifying the server address as you did in Part 1 and filtering www traffic. f. Create a second access list statement to permit ICMP (ping, etc.) traffic from PC2 to Server. Note: The prompt remains the same and a specific type of ICMP traffic does not need to be specified. g. All other traffic is denied, by default. Exit out of extended named ACL configuration mode. From R1’s perspective, the traffic that access list HTTP_ONLY applies to is inbound from the network connected to Gigabit Ethernet 0/1 interface. Enter the interface configuration mode and apply the ACL. a. Ping from PC2 to Server. If the pings unsuccessful, verify the IP addresses before continuing. b. FTP from PC2 to Server. The connection should fail. c. Open the web browser on PC2 and enter the IP address of Server as the URL. The connection should be successful.